Whip ricotta cheese, cream cheese, powdered sugar and vanilla extract in a medium bowl using an electric mixer. Divide mixture into six serving goblets and chill. Combine vinegar and granulated sugar in a small saucepan. Bring to a boil over medium-high heat. Reduce heat and simmer 2 to 3 minutes, stirring occasionally, until the mixture lightly coats a spoon. Cool completely. 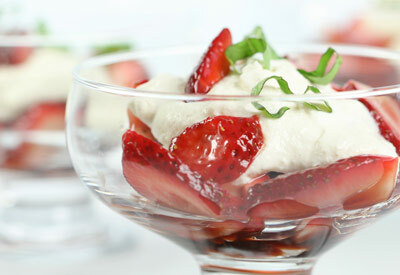 Toss strawberries with balsamic syrup. Evenly divide strawberries into each goblet. Sprinkle basil ribbons on each. Serve immediately.